Roast the nuts on a tray in the oven at 180º for 10 or so minutes until lightly toasted. Add half the nuts to the blender and blitz to a powder for 10 seconds on maximum speed. Add the remaining nuts (reserving 2 tbsp peanuts to add at the very end if you want a chunkier texture) to the blender, add ½ teaspoon of oil and continue to blitz for another 10 seconds. Add another teaspoon of oil and blitz for 3-4 minutes until you have a smooth peanut paste. You may need to add a bit more oil if the texture is a bit dry. Add honey and salt to taste and blitz to combine, adding the final peanuts for a short burst of blending. Put all the ingredients, bar the coconut milk and lime juice into a blender and puree till smooth. Add the coconut milk then the lime juice to taste. Check seasoning, adding any one of soy sauce, honey, chilli and fish sauce to suit your taste. 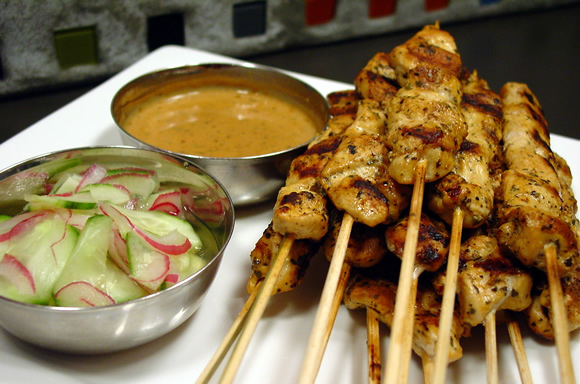 Serve with the satay sauce at the table as a dipping sauce. Soak eight wooden skewers in cold water until ready to use. Cut the chicken into small thumb-sized pieces. Toast the coriander seeds in a dry pan until fragrant, and then grind to a powder in a pestle and mortar. Add the coriander seeds along with the rest of the marinade ingredients to a blender and puree till smooth. Pour over the chicken, stir to combine and marinate for at least 30 minutes, but a couple of hours is best. Thread the chicken on to the skewers and cook over a high heat in a frying pan until cooked through, turning often (about 10-15 minutes).Serve with the sauce. Enjoy !